about a kilometre and a half from debbie's, heading back towards bridgend, there's a turn just at the start of uiskentuie strand that leads initially past foreland estate. it's a bit of an uphill slog in the early parts, but once at the top, the views over loch gorm and the atlantic will wipe the pain from your legs. this used to be something of an idyllic ride along a single track road that eventually leads to kilchoman beach, or, if you prefer, circumambulates the whole of loch gorm, passing saligo bay, ballinaby farm and carnduncan before heading north easterly to the rspb reserve at gruinart. i say 'used to be' because several years ago, the island's eighth and at that time, smallest distillery (kilchoman) was built at rockside farm, about 8km from the main road. though malt whisky distilleries were once considered simply to be industrial units, they are now fêted worldwide, attracting a serious number of visitors each year. those visitors almost invariably arrive by motor car, usually whacking great four-wheel-drive lumps that take up most of the roadway and rarely stop in passing places, either because they've no idea what passing places are, or through blatant arrogance. despite our knowledge of this present situation, one that will only get worse before it gets better, it's still an excellent, circular route over which to pedal, particularly once past the distillery. but you will perhaps have taken note that i mentioned the atlantic ocean when first describing the view to be admired on summitting at rock mountain. this is both a blessing and a curse, for even in these latter days of april, there are headwinds that are undoubtedly more than just a draught. oddly enough, that which was writ large this saturday past, came not from the atlantic but from the opposite direction, whisking spray off the top of the breakers at saligo. however, due to this area having been pummeled by atlantic gales and storms from time immemorial, there is, in fact, no shelter to be gained anywhere on the loch's perimeter, no matter from whence the wind du jour is blowing. and it's at times such as this when one's apparel takes on greater significance than when worn for a quick blast round richmond park of a saturday morning. even when pulling into a passing place to allow an oncoming tractor and trailer to pass, the body warmth gained from hammering into a galeforce headwind for the previous half an hour, all but disappears in a matter of seconds. that's when those back pockets come into their own, carrying either a gilet or more likely, a folded-up waterproof jacket. and this provided possibly the only downside i found when wearing either the louison bobet long-sleeve or short sleeve jersey. for though they sport a total of four pockets each, including a zipped security pocket, the middle on each seems crafted to hold only a mini-pump. it is undoubtedly narrower than those on either side and while i managed to secrete with ease, a lightweight gilet, i was unable to successfully stow a wind jacket alongside the mini pump. granted, those two other open pockets easily swallowed a lumix digital camera and a foldaway rucksack, but i'd maintain that the central pocket ought to be every bit as large as its peer group. however, i'm inclined to think that i doth protest too much, for in every other manner, the bobet jerseys are impeccable. the fit manages to flatter without deceit, the sleeve length on both is well judged and the merino/polyester fabric offers a quality that simple polyester will always struggle to emulate. the hem on each features an adjustable drawcord, while the long-sleeve version's full-length zip is contrasted by the short-sleeve's quarter-length. 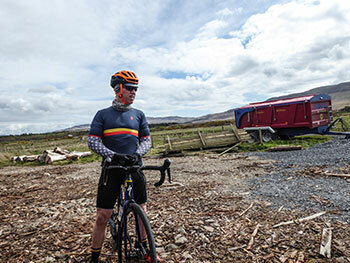 even when not wearing a windjacket or gilet, the jerseys, though not specifically windproof, offer some resistance to the breeze while retaining an impressive degree of warmth in the face of adversity. 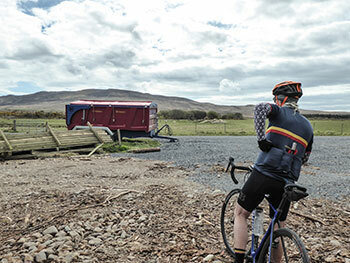 it is an inescapable fact that the sheer act of defying a headwind over an expended period of time will ultimately lead to discomfort in the saddle, partly due to a reticence to stand when pedalling and partly down to sheer air pressure. neither is it recommended for those with inherent back problems. 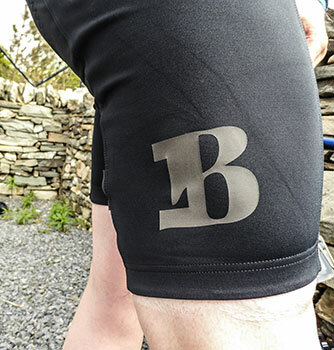 however, just how long the discomfort can be kept at bay depends greatly on the quality of your bibshorts and the luxury of the pad they contain. the louison bobet bibs, though a tad larger than my wardrobe of small-size shorts, were highly impressive. i managed a wind-inflected 75km without complaint from my undercarriage and no shouting from my shoulders. the white mesh bibs, though perhaps a tad shorter than others, seem to have hit the sweet spot between too much pressure and not enough. in addition, the leg grippers performed their function admirably, something to take note of if you wish to keep a sharp tanline (like anyone's going to acquire a tan up here). all three garments are adequately monogrammed with the louison bobet name embroidered on the back, with the 'b' logo featured on the chest of the jerseys and the legs of the shorts. both jerseys had a bobet photo image sewn into the leftmost rear pocket; a nice touch. the french-based company have definitely hit the ground running with well-designed, quality cycle clothing and a range that has much to offer the contemporary cyclist wishing for a less overtly modern style. my only other gripe concerns their mission statement 'riding with panache'. there's little doubting the truism of that statement, but i'd really rather they kept it to their packaging and didn't embroider it on the jerseys. currently, any order in excess of €100 (£85) benefits from free shipping and most garments are offered with a 30 day free trial. with a great deal to gain, what have you got to lose? the vars long-sleeve jersey is available in sizes small to xl at a cost of €155 (£131). the solingen short sleeve jersey is available in five different colourways in sizes small to xl at a cost of €150 (£127). the saintbrieuc bibshorts retail at €170 (£143) and are available in the same sizes as the jerseys. the louison bobet range contains pretty much every garment you'd need for riding and leisure wear.